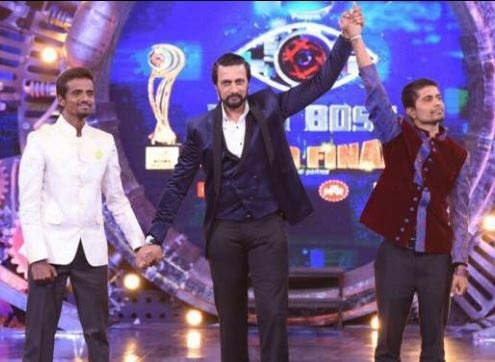 The favourite Kannada television show Bigg Boss Kannada season 4 has come to an end. Pratham is the title winner, and Keerthi Kumar is the runner up of Bigg Boss Kannada 4. The winner (Pratham) was awarded a title trophy and prize of Rs. 50 Lakhs. Pratham is a Kannada film director. Various celebrities congratulated and wished the winner through Social Medias. The grand finale episode was aired on Colors Kannada channel on 28th (Saturday) and 29th (Sunday) of January 2017. The finale telecast as two separate parts on Saturday and Sunday at 8.00 PM. The fourth season started on October 9, 2016, with a total of 35 contestants including the guests. The contestants were given various tasks every week. Pratham, Keerthi Kumar (kirik Keerthi), Rekha, Malavika and Mohan were the top three finalists of Bigg Boss Kannada 4 Grand finale. Rekha was the second runner up of the show. Kiccha Sudeep is the host of Bigg Boss Kannada. Bigg Boss Kannada follows the same pattern as that of the Hindi version of Bigg Boss. Bigg Boss Kannada 4 also have a weekend episode presented by Kiccha Sudeep. The first season of Bigg Boss Kannada started in the year 2013. The Bigg Boss Kannada has completed four seasons now, and the show is getting more popular now. Now every Bigg boss Kannada fan will be looking forward to the start of the next season. Check out the winner and runner up of Bigg Boss Kannada Season 4 Below. The grand finale telecast on Colors Kannada channel as two separate episodes on 28th January and 29th January 2017.